I'm interested in the breakdown of energy production by individual EU country. For the EU I found this site, it's good, but it does not offer the kind of breakdown I'm interested in - I'd like to see it in the format of 'stacked, one country, at a time' (i.e. 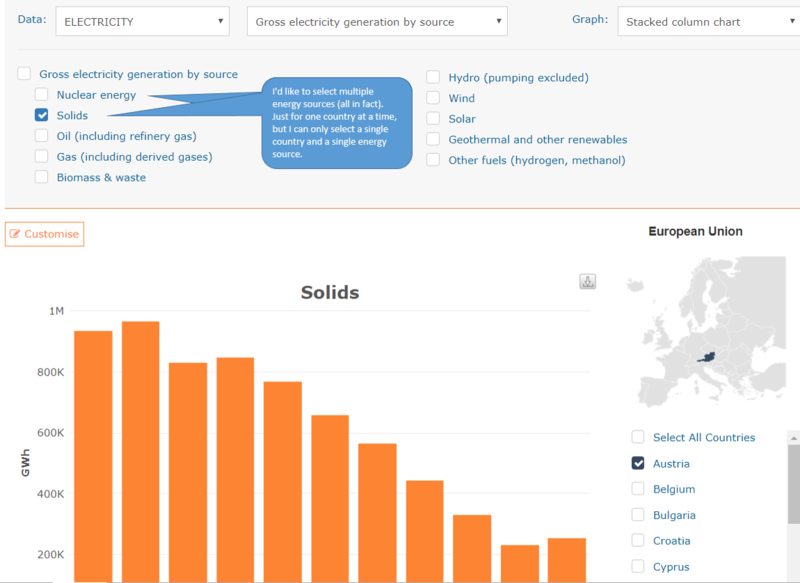 all energy production, but one country at a time) rather than showing the country comparison 'sector by sector' (e.g. all solar for all countries). I could download the data from here to a .csv file, but if something exists online, that would be better and easier to use. I live in the UK and what I'd like is something like the UK Gridwatch site which shows an interesting summary just for a single country; I am particularly interested in the 6 large electricity production graphs on this site (daily, monthly and yearly) - ideally I would like to see something similar for any other European countries. Limitations of the EU website. Ah, it seems I've hit the jackpot, Windeurope.org has data per country and per electricity source. You can pick and choose which countries you want to view. They also have some interesting summaries on wind generated electricity too - Denmark, UK and Portugal doing very well on their wind turbines at the time of writing. ALSO - see this excellent post on the OpenData Stack Exchange, thanks to Jan Doggen for finding this!